Brian Gionta has regained his scoring touch after a monthlong drought, but he's going to need some help to get the New Jersey Devils back atop the Eastern Conference. The Devils, struggling offensively, look to avoid matching their longest losing streak of the season as they visit the surging Toronto Maple Leafs on Tuesday night. Gionta snapped New Jersey's scoreless streak at 133:23 with his second-period tally against Montreal on Saturday night, but the Devils (37-23-6) lost 2-1 and fell out of first in both the Eastern Conference and Atlantic Division. The winger is the only Devils player to have scored in the last three games, recording two goals. The Devils have scored just four in their last four games, going 1-2-1. "We're just having problems scoring goals and creating chances of late," New Jersey goaltender Martin Brodeur said. The Devils have lost two straight in regulation following a 2-1 overtime loss to Carolina on Tuesday night, and are in danger of losing four straight for the first time since Oct. 18-27 (0-3-1). New Jersey is one point behind Atlantic Division-leading Pittsburgh and Montreal for the East's top seed. Brodeur continues to keep New Jersey in every game with his stellar play in net, allowing two goals or less in seven of his last eight games. He has started both games against the Maple Leafs (29-28-10) this season, going 2-0-0 with a 2.00 goals-against average. But New Jersey will need somebody to help Gionta on offense. Gionta has five goals in his last 10 games after failing to score in his previous 13. Gionta, however, has not tallied a point in either win over Toronto. Devils winger Zach Parise, who leads the team with 25 goals and 55 points, has been held off the scoresheet in each of his last four games after scoring a goal in the previous five contests. Parise has a goal and an assist this season against Toronto. Toronto is tied for 11th in the East, but playing like a team that could play the role of spoiler down the stretch. The Maple Leafs are 6-1-1 since losing two straight in regulation. 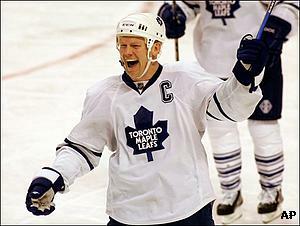 "I think it's been really exciting the last month or so," Toronto center Mats Sundin said. "Right now, we have a good mix, we have a good chemistry and we're playing a good system that fits us as a team." Sundin's outstanding play has sparked the Maple Leafs. The veteran center has five goals and nine points in his last five games, including a goal and two assists in Toronto's 3-2 win over Washington on Saturday. Toronto coach Paul Maurice said Sundin has played well all season, but he's had an extra burst lately. The teams will conclude their season series Saturday, when the Maple Leafs will again host the Devils.